In our first edition of Heather's Hotspots, interior designer, and wine, nightlife, and gourmet food connoisseur Heather Kates shared some of her favorite spots in Chicago! 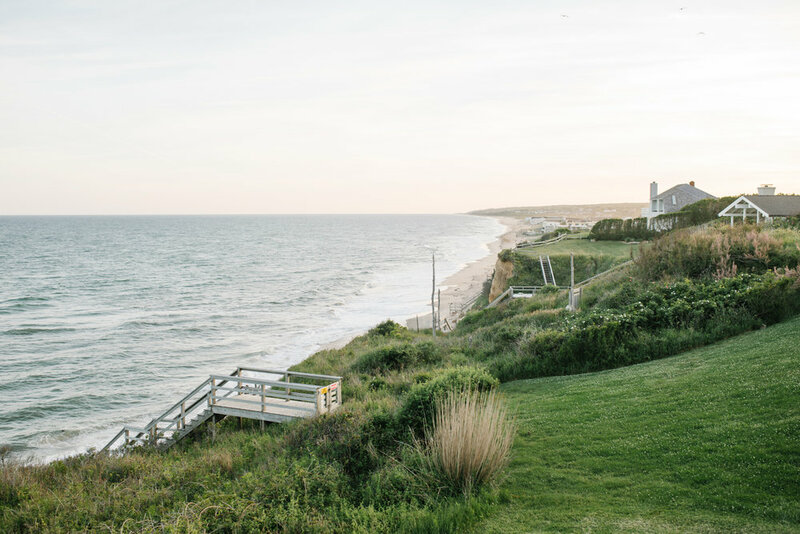 In this post, Heather takes us to her favorite destinations in the Hamptons, and especially in Montauk! I lived in Brooklyn for several years with my husband Malcom. When we lived there we loved vacationing in Montauk and visiting the Hamptons. Malcom's family is still based on the East Coast so we still visit as frequently as we can. We visited our favorite spots in the Hamptons just a weeks ago! So I thought, "Why not share our favorite places with the Crimson Design community?" We always drive up from the city. There's no better way to visit the Hamptons than by car. Driving through all of these communities is so fun because whether it's Westhampton Beach, Bridgehampton, or East Hampton, each town and village has something to offer. Montauk is on the furthest Eastern tip of the Long Island peninsula and is fondly referred to as "The End". So driving there takes us through a ton of great towns. Along our drive we always stop at Breadzilla in Wainscott, located off of the Montauk highway, only 30 minutes south of Montauk. They make the most incredible sandwiches, bread, pastries, you name it. Plus, as a bit of a cheese fanatic, I'm a huge fan of their absolutely top notch cheese selection. We always stock up on good cheese and bread there, and then continue driving up the highway to our next favorite, must visit stop. Our next stop on the drive is always Domaine Franey, located in East Hampton. After stopping in Breadzilla and stocking up on bread and cheese, we absolutely have to buy a few bottles of wine from Domaine Franey. After all, nothing says "vacation" like sitting on the porch of your beach house or on the balcony of your hotel room, sipping a glass of wine, and watching the sunset. There are tons of vineyards in the Hamptons and Domaine Franey has a huge selection of local wines, more than any other wine shop I've visited in New York so far. I highly recommend stopping there, whether you want to try local wines or wines from France or Italy, they'll have something you'll love. Guaranteed. After our provision stops, we make our way up to Montauk. The drive up to East Hampton is really interesting because there are a ton of vineyards, potato fields, and agricultural communities. After East Hampton, the scenery really changes. You start to get dunes and pine trees. It's just lovely. Personally, out of all of the towns in the Hamptons, I like Montauk best because the vibe is so relaxed and beachy.... it feels like a retro beach town. Think Pismo Beach with an East Coast flair. Montauk has a rich fishing culture and a vibrant surfing culture too. In some places we've stayed in Montauk, we've woken up early and seen the surfers out in the water, waiting to catch the perfect wave. Whenever we visit we prefer to stay in a house. We love having access to a fridge and kitchen (remember all that wine and cheese we bought on the drive up?) and there's something so relaxing about having the privacy a rental house affords. But, if you like resort vacations better, I highly recommend Gurney's Resort. 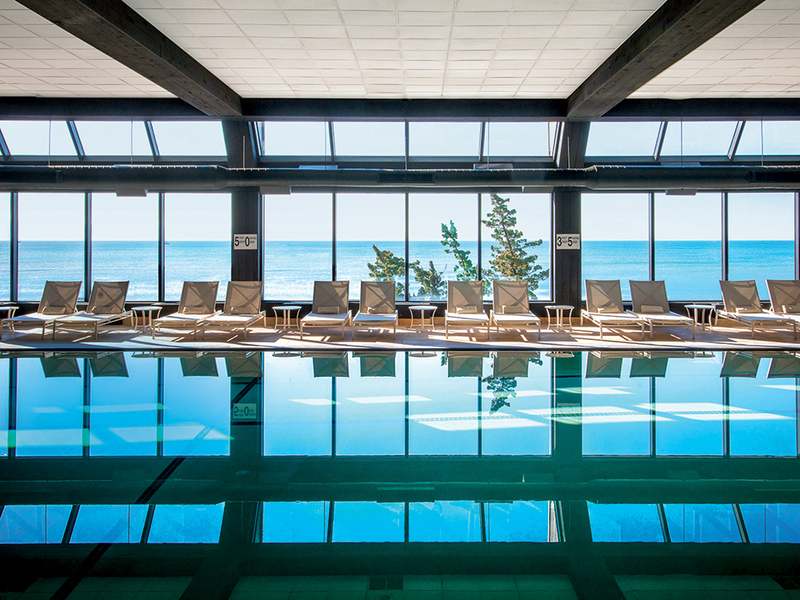 It's a Hamptons icon, really, and in the last few years they've completed renovated and updated the design of the resort. It current has 146 rooms and suites, five different dining and drinking venues, a spa, and a totally unique, ocean fed salt water pool. It's definitely a luxurious resort and a one of a kind vacationing experience. Even though we don't really stay at Gurney's, we still take advantage of one of their restaurants: Scarpetta Beach. Scarpetta Beach is the sister restaurant of the downtown Manhattan restaurant of the same name. The dining room is gorgeous. The design is mid-century modern but with a beachy twist. There's an outdoor deck that overlooks the ocean... honestly the ambience alone makes it worth a visit. The views and design combined with the restaurant's amazing menu (think raw yellowtail, creamy polenta, lobster, the best spaghetti you'll ever taste, seared scallops... I could go on but I'm getting hungry just thinking about it), makes the experience of eating at Scarpetta Beach similar to the experience of getting dinner on the Amalfi Coast: simply incredible. One of our favorite things to do when we're on vacation is to find a good dive bar. I love James Beard Award winning restaurants and Michelin star winners too, of course. But I love finding places that are loved by the locals and have a quirky vibe! 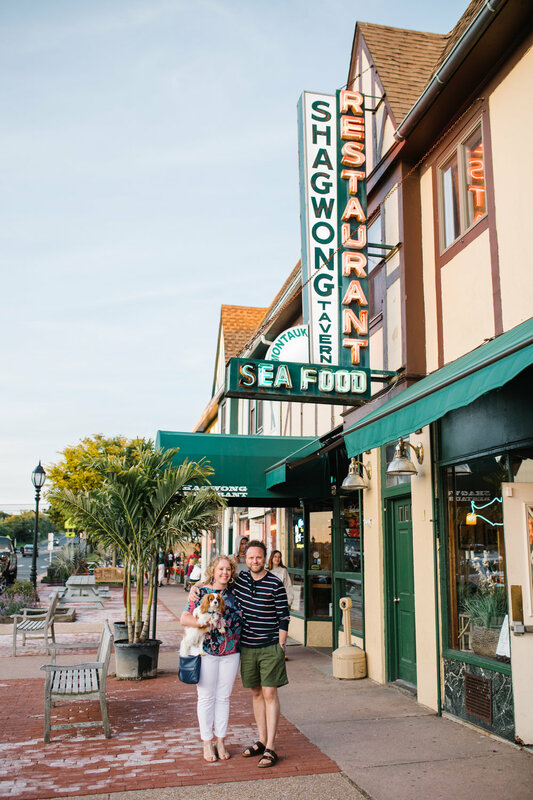 Shagwong Tavern in Montauk is the perfect place to eat and drink like a local and experience the village's small town vibe. Shagwong has been around since 1936, offers locally sourced sea food, and a plethora of themed nights (eg. Ladies Night, Industry Night, etc). One of my favorite memories there took place during the holidays. We were in town visiting for New Year's and it was the first year OSU was in the playoffs. So we went to Shagwong to watch the game. We were the only ones in the bar and the bartender eventually just sort of left us there. So we just served ourselves! We poured our own drinks for hours. Of course we paid for all of our beers when the bartender came back but this is the kind of "small town" vibe I'm talking about. Where else would this happen? Plus, if that's not charming enough for you, get a load of this: They have a sign perpetually in the window with the phrase "Piano player wanted. Must have knowledge of opening clams". Malcom has a t-shirt with that printed on it. It's the best. Another local mainstay we love to visit while we're in Montauk is The Inlet. 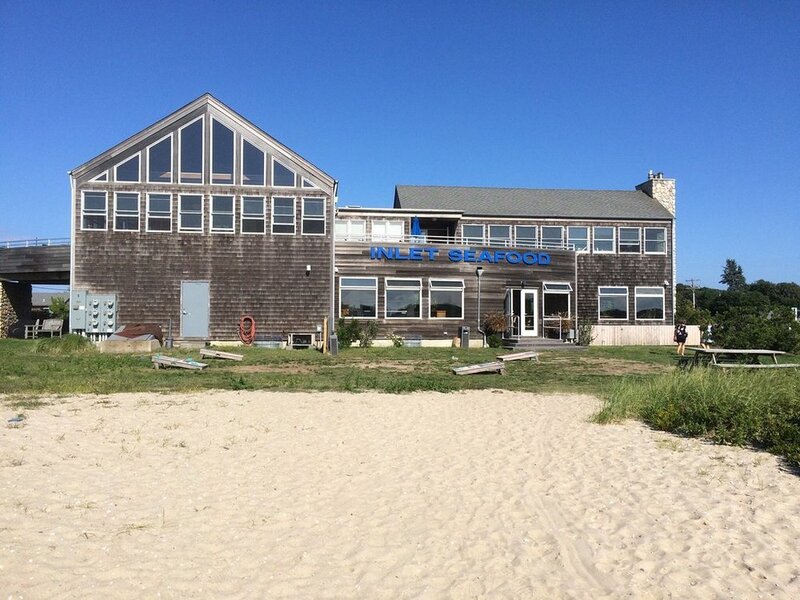 It's owned by six local fisherman from Montauk and was opened in 2006. They offer a huge selection of incredibly fresh fish, shellfish, and sushi. To quote their site, their sushi make be the freshest you've ever tasted, "often swimming just the day before". Truly, this place is a gem. Plus, the view of the Long Island Sound from the patio deck is gorgeous! 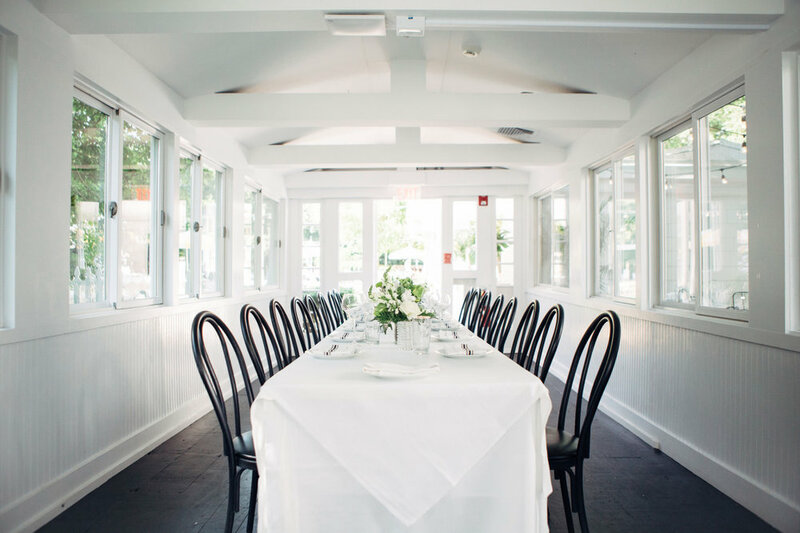 If you find yourself in need of another dinner spot, definitely set aside time to visit EMP Summer House, in East Hampton. EMP Summer House is the beachy sister to Manhattan's Eleven Madison Park, one of my all time favorite restaurants in the city. EMP Summer House is a great alternative to Eleven Madison Park. The food is incredible, the cocktails are one of a kind, and the ambience is great. But, in contrast to the original EMP, EMP Summer House is less "hip" and more "relaxed and beachy," which is exactly what you want from a restaurant in the Hamptons. And, as an added bonus, the menu is surprisingly affordable. On our drive back down to the city, we obviously want the vacation to keep going for as long as possible. So we love to stop off at Wölffer Estate's Wine Stand in Sagaponack. It offers all of Wölffer's wines and ciders by the glass or by the bottle to drink there or take to go. And, from 5pm to sunset during the Summer, live music plays behind the vineyard. It's truly magical. If you like to shop while on vacation, I really recommend visiting two of my favorite furniture and antique shops on your way back from Montauk: Mecox Gardens and WYETH. Mecox Gardens in Southhampton carries a lot of the vendors that we use in our designs here at Crimson but they also carry furniture pieces made by furniture builders and artisans local to the Hamptons and New York State that you can't really find anywhere else. The shop is located on three acres and surrounded by gorgeous gardens. It's a great place to get inspired and find unique pieces for your home, whether you're an interior designer or a design fan. WYETH in Sagaponack is a great collector of mid-century antiques and they always have totally one of a kind finds. I've found gorgeous furniture there and some of my all time favorite antique light fixtures, too. Montauk is really a one of a kind vacation destination and traveling there every summer is truly the highlight of my year. I hope you feel inspired to visit, yourself! Make sure you don't miss a single blog post! Follow us on Instagram for weekly updates!